LAGOS JANUARY 17TH (URHOBOTODAY) – A mother of three, Mrs.Dinness Ekpe, has been killed in a kerosene explosion which occured in Enekorogha, a riverine community in Bomadi Council Area of Delta State. Two other persons have been hospitalised as a result of the explosion. The explosion was caused by adulterated kerosene reported to have been circulating around the riverine Ijaw communities of the state. The deceased died as she was being evacuated through a speed boat to the hospital. Another victim, Mrs. Joy Kenneth, reportedly suffered severe injuries from another kerosene explosion few days ago in the Bomadi axis of the state just as Mrs Bideke Smith also sustained injuries from another kerosene explosion in Esanma community in Bomadi council area. Confirming the story, a community leader, Mr. Adobo Wikimor, said the incidents have created so much fear and panic in the Ijaw speaking communities. Wikimor said: “The beautiful woman is now like a ‘ghost’ after the kerosine fire explosion. She was cooking with her stove when the stove suddenly exploded and the flames burnt her severely. “It took good spirited neighbours to put off the fire. She almost died before we rushed her for medical attention in Bomadi. 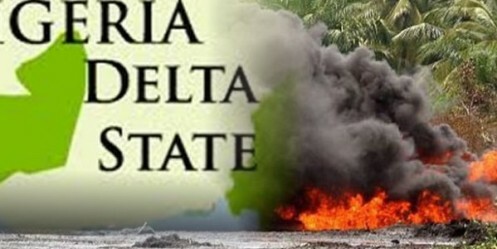 Another community leader, Chief Richard Enaredei (JP), confirmed the circulation of the killer kerosene in the Ijaw speaking communities of Delta State, saying the adulterated kerosene has been a source of fear to many families in the past few months. “We have been living in fear over the incessant incident of kerosene explosion. “Many people are lying critical ill in the hospital as a result of injuries suffered from kerosene fire incidents. “You know the Ijaw area in Delta State has not been connected to the national power grid and so kerosene is the only source of cooking for our people in the villages. “We use the kerosene to cook through stove, apart from fire wood. It also powered our lanterns during the night,” he said. He called on both the state and Federal Government to investigate the incidents with a view to forestalling its spread to other parts of the country. The adulterated kerosine was said to have been circulated by operators of illegal refineries in the Niger Delta region though a relative to one of the victims disagreed saying his sister bought the killer kerosene at a filling station in Bomadi .